Make any Machine a Smart Machine – Pumps, Motors, Gearboxes. Leveraging ITT’s 160+ years in process pump control systems, we work to deliver on one goal – increase profitability of your plant by solving problems with process uptime, maintenance, and energy costs. The ITT Pro monitoring products help you make the time critical equipment decisions before there are issues. Unplanned machine failures can cost 10 times more than planned maintenance. The right pump control systems allow you to scan multiple machines at the same time, which saves you time for analysis and troubleshooting. There are 2 primary product lines, i-Alert2 and PumpSmart. The i-Alert2 provides continuous machine health monitoring of any rotating machine such as pumps, motors, fans, and more. The i-Alert2 makes it easy for the every day user to conduct machine monitoring. A Bluetooth® Smart wireless connection allows monitoring from a safe distance. Advanced vibration diagnostic tools are available to anyone who can use a smart phone or tablet. 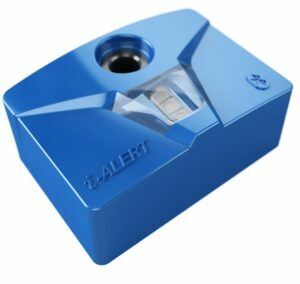 Watch the videos below to learn more about the i-Alert2. Records tri-axial vibration, tria-axial kurtosis, temperature, and run-time hours 24/7/365. Checks every five minutes and alarms if equipment is outside normal operating conditions. Easily installed – bolted onto the machine, epoxied to the machine with a mounting adapter or magnetically attached. Battery powered for 3-4 years under normal use. Free Download of the i-ALERT mobile phone app let every day users monitor conditions on your rotary equipment. Monitor all i-Alert enabled devices on machines wirelessly from a safe distance. Store condition data – Trend vibration, temperature and kurtosis data once per hour and on alarm for 170 days. Stores the weekly average, minimum & maximum up to 5 years. 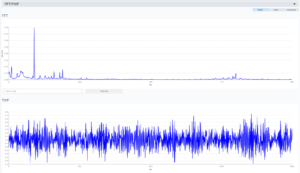 Download tri-axial vibration spectrum data in the form of the Time Wave Form and Fast Fourier Transform data sets to diagnose machine faults. Look up machine data – at the machine. For ITT Goulds Pumps equipment enter the serial number and load a repair parts list, pump performance curve and pump data sheet. Automate your data collection activities. Just like setting up a music playlist select the machines, schedule, time, type of route and follow the on screen instructions. i-ALERT app generates reports for you – a huge time saver. 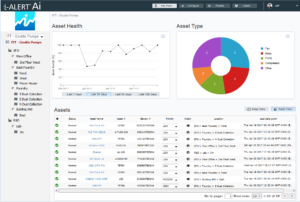 Monitor and manage of all your i-ALERT enabled machines and sensors in one place. This subscription service requires no software to download or dedicated hardware to run. Track overall performance of all your machines in your plant. Set up different sites, zones or areas to compare how one area is performing to the other. Stop wasting time piecing together the machine history from different data sources. View trend data, machine notes, technical data and vibration spectrum data all visualized in a simple timeline. View vibration spectrum data in all three axis. Use the built in analysis tools to view and analyze FFT (Fast Fourier Transform) and TWF (Time Waveform) data sets to diagnose machine faults. Create, View, Assign and Edit data collection activities from the Routes Control Center. Measure on-time performance, see what routes are due, when, and by whom. 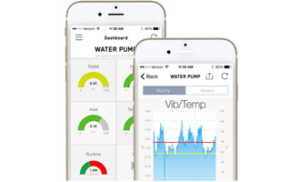 PumpSmart pump control systems provide real-time control of your pumps while also providing protection and valuable data analysis. PumpSmart controls keep your process operations running longer and decrease unplanned repairs by preventing pump failures. +Contact Hayes Pump for personal assistance and quotes.